Chris Lewit's training location in Europe is at CLTA's sister academy, Bruguera, in Barcelona. He uses the Bruguera Academy as home base for his players traveling to junior and professional events overseas. Chris can also arrange to send teams of players to train in Spain at other academies and locations in Mallorca, Valencia, or Alicante. 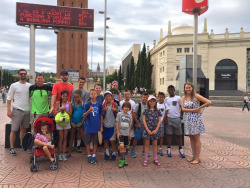 Chris is available year-round to travel with individual players or teams in Spain. In August, at the conclusion of summer camp in Vermont, Chris takes a team of players to Spain for several weeks. This summer will be our 12th year making the team trip to Spain!